The emergence of Ryde as the principal point of entry to the Isle of Wight was due in no small part to the opening if Briatin’s first ever pier by the Ryde Pier Co. in 1814. Predating the railways in the the Isle of Wight by upwards of 50 years the pier was extended on several occasions before reaching its final half-mile length in the 1840s. The pier was ideally placed to benefit from the growth in travel to the island but its length was a grave disadvantage before the opening of a horse tramway in 1864. When the first railways in the Isle of Wight appeared during the 1860s the pier company was dragged into a fight with other promoters for the traffic through Ryde. Add to this a local authority implacably opposed to railway on the foreshore and we have a recipe for years of frustration and expense. The construction of extensions to the tramway terminus at St Johns Road crippled the finances but its hose-drawn traction pleased no-one. The London & South Western and London, Brighton & South Coast companies jointly built a railway as a replacement for the extensions and which finally ended the pier company’s ambitions. 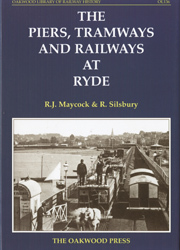 The Ryde Pier Company was a pioneer in trying different methods of traction developed not for the benefit of railways but Britain’s street tramways. Light steam locomotives were hired on two occasions and two steam tram locomotives worked the pier tramway for four years. The later electrification of the pier tramway took place well before such systems became generally accepted and anticipated by many years the use of third rail electrification by the railways. A5 foramat, 176 pages, more than 120 illustrations.